On a cross-country flight, you should be able to determine precisely where you are at any given moment; therefore, the use of en route checkpoints is essential. On many cross-country routes, however, there are few, if any, reliable checkpoints on the ground. Even in actual flight, the terrain is often relatively undistinguished, and small towns and even airports can look very much alike from the air, so reliable physical-feature checkpoints may be few and far between. If you know how to use the VORs, however, your NAV receivers will provide you with reliable checkpoints virtually anywhere in the continental United States. On this flight, you'll learn how to bring NAV-2 into use for tracking your position en route. You'll depart from Bloomington, which you'll find at the lower left of the Chicago Area chart; from there you'll track a radial north to the Joliet VOR, and then you'll turn east and proceed directly to Midway Airport. You'll be using NAV-1 for the VOR radial you're tracking, and you'll be setting NAV-2 to a series of nearby VORs along the way—to monitor your position and to pick up a series of en route checkpoints. The flight covers about 100 miles, which, at 120 knots, should take about 55 minutes. The route is shown in Figure 2-8. This flight is somewhat pivotal: Once you can use the VORs in the manner described here, you'll be able to plan and efficiently navigate any cross-country simulator flight of your own choosing. NAV-1 Setting. If you glance at the chart, you'll find the Joliet VOR up near Chicago. Before departure, you set NAV-1 to that station's 010° radial; in flight, you'll track that radial inbound to the station. NAV-2 Setting. Notice the Peotone VOR, just to the right of your course. You set NAV-2 to Peotone, and, while you're using NAV-1 for tracking the inbound radial to Joliet, you'll be monitoring NAV-2 to track your position along the way, as you proceed across one Peotone radial to another. Checkpoint 1. Depart Bloomington on Runway 11; then turn left to heading 050° during your climb, finally leveling off when you reach 3000 feet. The heading of 050° will give you a 40° intercept angle with the Joliet 010° degree radial—your first checkpoint—about 12 minutes after departure. As the NAV-1 needle is about to center, glance at the clock and write down the time—your ATA at checkpoint 1. Then turn left to 010° and get the NAV-1 needle centered. Checkpoint 2. You'll have set NAV-2 to Peotone's R-240 before takeoff. Therefore, when the NAV-2 needle centers, you're on R-240. At that point, you write down the time and figure your ETA for checkpoint 3. Then you set the NAV-2 bearing to 270, for checkpoint 3. Position Between Checkpoints. As you proceed en route between checkpoints, toggle the OBS bearing on NAV-2 from time to time to track your position. Change the bearing up or down until the needle centers, and then the bearing indicator will reveal which Peotone radial you're actually on at the moment. That gives you an idea of just where you are and of how far you are from the next checkpoint. Checkpoints 3 and 4. Checkpoint 3 is Peotone R-270, and the checkpoint 4 is station passage at the Joliet VOR. 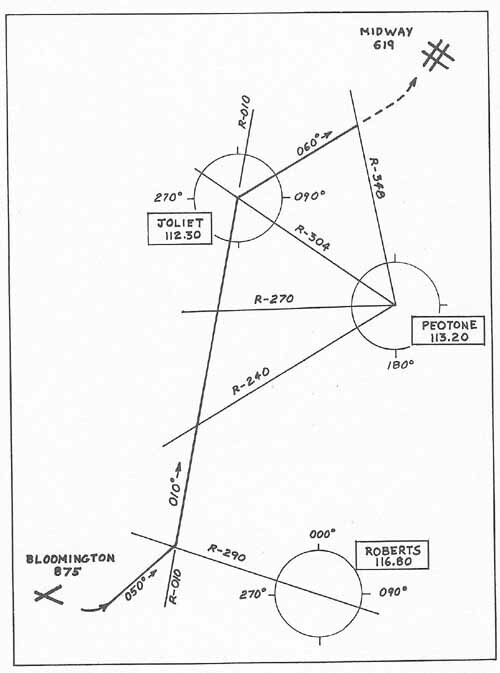 At that fourth checkpoint, the DME will read zero, and the NAV-2 needle will center with the bearing on Peotone R-304. Note the time and write it down just before the DME falls to zero; then start your turn to 060° right at station passage. Calculate your ETA for checkpoint 5 after you're established on your new course of 060°. Checkpoint 5. The fifth and final checkpoint is Peotone R-348. At that point, you'll be 21 miles DME out of Joliet and about 8 miles from Midway airport, so be set up for the approach before you reach that checkpoint and begin your descent to Midway as soon as the checkpoint is reached. Approach. You'll be cleared for a straight-in approach to Midway's Runway 4 Left. As you near the airport, therefore, you have to turn left to 040° to line up with the runway. The set-up parameters follow. Make a freehand copy of the accompanying flight plan form on a plain 8 ½ x 11 inch pad now, for use en route.